Our world revolves around the Sun. It provides warmth and creates a sense of time, giving a routine to life. Within that framework, we define our personal reality. This horse’s registered name is Sunbrite Sunset. It’s a name he arrived with, both pretentious and embarrassing- almost silly to my ear. We’ve spent a lifetime revolving around each other, creating our tiny universe, reflecting the sun back to each other. 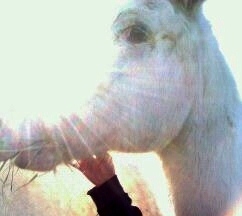 This photo is how I see Spirit, and finally, I’ve made peace with his name. ← A Retirement Resistant Spirit.